In some ways, it has been a classic October in southwestern Wisconsin. Wooded hillsides have turned red and yellow and orange. Pumpkins have migrated from fields to front porches and storefronts. Slow-moving combines and tractors block impatient cars as the corn harvest proceeds. In other ways, it’s an unusual fall. The average temperature for the state of Wisconsin as a whole this year is running almost five degrees above normal. It’s November 2 and so far there have been only a couple light frosts—so light that my garden beans and even some tomatoes are still producing. We are some three weeks past the average first frost date. The long-range forecast, stretching into mid-November, shows nothing close to freezing. In our locale, we also had an unusually rainy and humid summer, with several extreme episodes of rain. Climate scientists are accustomed to cautioning that any given stretch of atypical weather does not a climate change signal make. However, we are all increasingly sensitive to possible signals where we might have heard only noise before. In this year of heat, rain, and humidity, the sound of abnormality has been quite literal: the buzzing of mosquitoes. At my place—a rural setting along the Wisconsin River—we have had bad mosquito seasons before, but I do not recall one so long-lasting. Even as I type these words, a mosquito flits along the screen in the window next to my desk. On November 2. In Wisconsin. This is weird—and consistent with global weirding. Several weeks ago I was walking one late afternoon with friends in a nearby field. The long rays of sunlight illuminated squadrons of dragonflies cruising over the tall grasses, busily providing free ecosystem services. The dragonflies, hundreds of them in all directions, were gorging themselves on the abundant mosquitoes. In some parts of the South, dragonflies are called “mosquito hawks.” Amid the frenzy, one could almost see the graph of their matched population growth curves: the outbreak of mosquitoes closely synchronized with the dragonfly hatch. Such dragonfly-on-mosquito predation occurs not only among the adults, but among their respective larvae as well. Mosquitoes have also been abundant in the news recently, headlined as carriers of the Zika virus. Debates are being waged over the potential uses, risks and benefits, and ethical implications of emerging technologies in synthetic biology to control and even eliminate mosquito populations. In particular, the development of the gene-editing tool CRISPR-Cas9, has opened up new possibilities for rapidly driving genetic modifications through populations of plants and animals, enabling us to alter the genomes—and hence to intentionally redirect the evolutionary pathways—of entire species. As the debate swirls, I see the field teeming with dragonflies—a reminder of the ongoing ecological and evolutionary processes that provide population checks-and-balances in the invertebrate world. 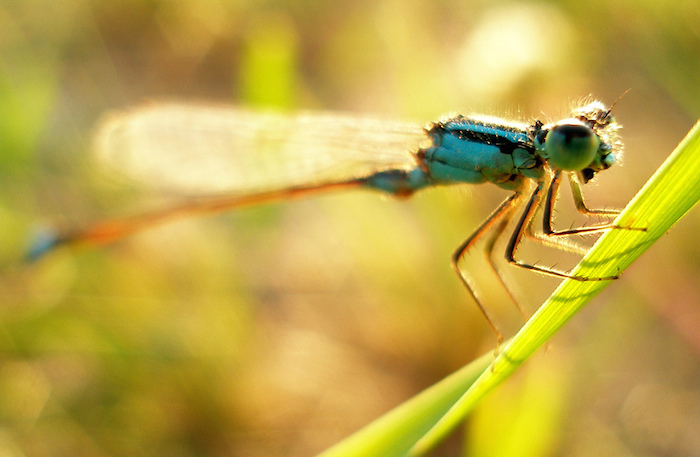 Dragonfly predation can play a role in providing biocontrol of mosquitoes. [6, 7] That said, in a biosphere where humans are driving extensive, rapid, and accelerating changes, dragonflies are unlikely to come to the rescue. We ought not to expect that they can kick in ecologically, like the seagulls miraculously saving the Mormons’ crops from the insect hordes, or the indigenous Earthly microbes that ultimately brought down H. G. Wells’ invading Martians. But the dragonflies do remind us that, in all our actual and imagined interventions, we are always dealing not simply with species, but complex systems. Gene drives do offer the promise of finer-grained and precisely targeted interventions—a more direct silver bullet, as it were. But we soon find ourselves on a classic slippery slope. Once a species is targeted or a situation identified for gene-drive-enhanced intervention, when do (or can) we stop? In the case of Zika and mosquitoes, the case and the reasoning is relatively straightforward: apply the new gene drive technology to address an imminent threat to human health. Yet, even if the technique works as prescribed and intended, questions arise. How quickly will new populations of Zika-carrying mosquitoes arrive to fill the void created by the eradicated population? How many times will the application of the technology be required? How will climate change affect the future incidence and spread of Zika (and other emerging mosquito-borne diseases) in the locale? In the region? Globally? Take another case: the proposed release of gene-drive-altered mice to control the spread of Lyme disease on Nantucket Island. “Nantucket boasts some of the highest Lyme infection rates in the country, and the idea… would involve modifying the genes of tens of thousands of mice to keep them from spreading the Lyme bacterium to ticks, which in turn infect people.” If approved, this would constitute the first release of animals modified with CRISPR technology with the intent of altering the genome of the target species. At this inflection point on the slippery slope, the caution signs are more evident, and more questions again arise. Will treating one particular vector break the ecological chain that results in the high incidence of Lyme disease? Will we need to modify the genomes of other mammals that contribute to the prevalence of Lyme? What of the other landscape factors—high white-tailed deer populations, changing forest cover and composition, disrupted fire regimes, the presence of tick predators—that affect Lyme? If the mouse species becomes a vector for another communicable disease, will we alter its genetic makeup again? Or take another case, involving the application of gene drives to biodiversity conservation efforts. Among the most prominent interventions being proposed is the use of gene drives in Hawaii to eradicate the mosquitoes that carry avian malaria, a main factor in the demise of Hawaii’s native honeycreepers and other threatened songbirds. Mosquitoes are a recent arrival to the Hawaiian chain, and the intervention would in fact be a response to an already highly altered ecological condition, with the aim of enhancing elements of native biodiversity. Even the most risk-averse conservation biologists are likely to give some deeper consideration to this application of the technology. Anne and Paul Ehrlich famously compared the loss of species to the careless popping of rivets on an airplane. Now, in cases such as mosquitos and the Zika virus, we face the possibility of deliberate rivet removal, weighing a human health risk against a conservation risk. With the Nantucket mice, we are proposing to enhance public health by replacing one rivet with a new-and-improved one. In Hawaii—to stretch the metaphor a bit more—we are considering the possible conserving of some rivets through the removal of other rivets that have been inadvertently drilled into the fuselage. Such human health and conservation applications of gene drives only invite yet more questions about the profile and contours of the slippery slope we face. Where do we draw the line between an imminent health risk or clear conservation threat, and a mere annoyance? Why not eradicate all human-biting mosquitoes on the basis that… they bite humans? What is the line between a real threat and discomfort? Why not eradicate any species that inconveniences us in any way? Why not eliminate all bees that sting, all flies that buzz, all the serpents from our gardens? If and when such technologies become inexpensive and readily available, will a profit-driven marketplace seek to relieve any and all of our irritations, maximizing our individual self-interests, dismissing ecological concerns, and externalizing costs all along the way? When, in some future hot and wet summer, the mosquitoes are gene-driven from my back yard, will I be grateful for the effective (if limited) climate-change fix? Or will I miss the darting dragonflies, flashing in the sun? Chatterjee, S.N., Ghosh, A., & Chandra, G. (2007). Eco-friendly control of mosquito larvae by Brachytron pratense nymph. Journal of Environmental Health, 69, 8: 44-49. Ehrlich, P. R., & Ehrlich, A. H. (1981). Extinction: The causes and consequences of the disappearance of species. New York: Random House. A collection of resources for understanding gene drives.